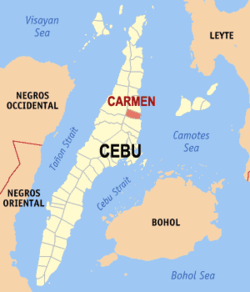 The Municipality of Carmen lies at the Northeastern coast of Cebu Province and is approximately 38.6 kms from Cebu City. It is bounded on the North by the Municipality of Catmon; on the South by the City of Danao; on the West by the Municipality of Tuburan; and on the East by Camotes Sea. Carmen's topography is characterized by coastal flood plains 0-35 in slope extending one to three kms. inland. Slightly rolling hills with interspread flat lands with slopes 3-155 rise parallel to the plains and are met further inland by a series of highland mountainous ridges with slopes ranging 18-505 and above.